Take a break from reality and checkout Fairyland. Catch a puppet show, find a rabbit hole and climb up the Jolly Roger. Moderately priced at $8 for adults and kids over 1 (under 1 are free), Fairyland is an affordable outing. Make sure to grab a key to the fairytale story boxes – $3 a key. Bobby loved holding and using the key to unlock the story boxes. 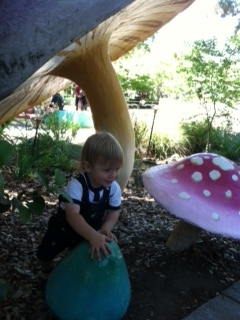 Bobby and CJ recently experienced Fairyland. He loved running around the grounds, exploring miniature houses and riding the little train around the park. They also loved sliding down the rabbit hole into a painted tunnel. At the end of the tunnel, they enjoyed the painted maze themed after the Queen of Hearts. 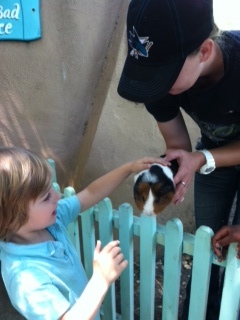 Then,we popped by to meet Peter Rabbit. The music tunnel is pretty fabulous as well. Both boys basically ran in circles, discovering instruments along the way. The best part was getting to stand in the middle watching them run around. Ahh, life as only one can experience in fairyland. Fairyland has more than fairy themed play structures. It has puppet shows and guest appearances from characters like the Cat in the Hat. There are children’s theater performances from June to October. We may catch the show about the dragons. While the theater performances are less frequent, the puppet shoes run daily. Who knew that a puppet show would mesmerize a two busy bustling boys? I sure didn’t. They loved watching and listening to the story of the Elves & the Shoemaker. Of course with so much active play, the kids might need some fuel. Fairyland does have a simple and moderately priced snack bar. With PB&J, chicken burgers and turkey sandwiches on the menu, you’ll find something. I’d have to recommend the sandwiches over the burgers though. The chicken burger I ordered was breaded and fried, resembling a hockey puck. If you want to play it safe, you can bring your own lunch as Fairyland has a grassy picnic area. After lunch, you can let your tots expel excess energy by running around the playgrounds. Then pop back in the car and enjoy a quick drive back to the Valley or stay in the Oakland area and enjoy a myriad of things to do. Berkeley Bowl is worth a stop. With endless rows of fresh produce, it’s a great educational not to mention culinary experience for wee ones. For other ideas check my article on Tilden Park . This entry was posted in adventures, day trip, Uncategorized and tagged Children's Fairyland, Disneyland, Fairyland, Oakland, Oakland California, Pinocchio, Puppetry, Queen of Hearts on June 23, 2013 by Modern Mama.